My name is Simon Xie, and I created the XM World e-Drums company back in 2004. XM is one of only two companies worldwide that solely focuses on producing electronic drums, but our competitor only has one drum kit, whereas we have a large number of options ranging from beginner’s sets to elaborate expert kits. Let me give you some insight into the history of XM World. I started playing drums when I was 17 years old. Strangely enough, it was in a marching band at high school. I think I arrived late for choosing an instrument, and subsequently played the cymbals for 3 months. Needless to say, it wasn’t the most auspicious start to my experience with drums! By the time I was 19 years old I was playing drums for a rock band, which we formed in college. We played for several years and even entered into some ‘Battle of the bands’ competitions in Taipei, Taiwan, and we won! I played a New Sound drum kit, which is very famous in Taiwan. Essentially, it was made in the same factory as world famous drum producer DW, but had a different logo stuck on it for the local market. When I first played an e-Drum, I didn’t like the experience at all. They didn’t look good, and more importantly, they didn’t sound great either. After leaving the obligatory Taiwanese army program when I was 27 years old, I started my first job as a drumming teacher. I taught both in schools and privately for 2 years before deciding to create an e-Drum company, of which I have always been the principal designer. I used to live in a small Taiwanese apartment in the city, as is the situation for the majority of Taiwan’s population. I couldn’t play drums loudly, as my neighbours would rightfully get upset, which meant I had to teach my students on e-Drums in conjunction with headphones. If you live in a major city around the world, you could probably empathise with my situation. I bought and sold Roland and Yamaha electronic drum sets to my students, but my pupils just didn’t like the look, sound, or feel of those digital drums. The general consensus was clear – they wanted electric drums that looked and played like real drums. So, it was for drumming education purposes I first decided to embark on the quest to assimilate real and digital drums into a single working system. When I was 28 years old I began trying to create a new e-Drum. I had already studied Mechanical Engineering at the National Formosa University for 5 years, so this decision wasn’t taken out of context. However, the process was very difficult, and I soon found myself needing to create a team, which most importantly involved sourcing an Electronics Engineer. By the time I was 29, the first XM electric drum set was born. 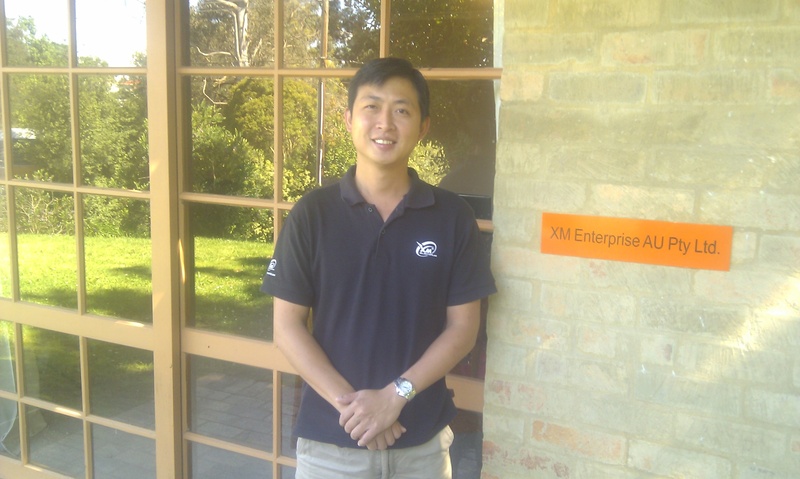 I called it ‘XM’, because my last name is Xie, and this was my ‘model’. Since those early days we have now created over 40 different e-Drum sets, improving on models each time. We have always been very conscious of the competition’s designs, but we didn’t want to copy them. Our goal has always been to compete with Roland and Yamaha by creating an e-Drum product that is better (in touch, look, and sound), and which is completely different in style. Now, we have e-Drum kits like the Classy Series Custom Plus 9SR, which are the best digital drum kits worldwide for drummers who wish to seamlessly transition from the practice room to a real drum kit at a live performance or concert. XM World e-Drums and Mesh Heads are sold globally, but still designed in Taiwan where our main factory has been located since 2004, whereas our main competitor 2-Box has only existed since 2008. Our revolutionary XM Evolution Mesh Head Drum Skin system can turn any old drum kit into drums that have amazing sound quality. We have a large number of employees working in a number of countries, but deep down we are a family-based organisation. This is the Taiwanese way. I live in the factory, which is great for inspiration, as my ideas can go right onto paper. My best friend Alex Ku is the Chief Electronic Engineer, and a number of family members work either in our factories or overseas in marketing and distribution. XM World is already a popular brand in Asia, where housing has been high density for a long time, but we are now reaching a wider global audience. We have distributors in Australia, Germany, Russia, France, Brazil, the United Kingdom, Ireland, Israel, Turkey, Poland, New Zealand, Panama, and of course in Taiwan, China, Korea, Malaysia, Thailand and Singapore. If you love drums and have yet to try out an XM e-Drum kit or XM Evolution Mesh Head Drum Skin system, a world of opportunities truly awaits you! I enjoyed reading your posting and wish I had read it before I bought a Yamaha electronic set for my son. He is only 16 and recently became interested in jazz and now wants a regular drum set as well. I know you are busy and may not be able to assist but I would welcome any advice about where to buy a drum kit in Taipei and perhaps even a recommendation about a reasonable model. I don’t want to get caught up in brand names but I want to get him a good set. Thanks for your email. I would like to invite you to visit our factory in Changhua. We have a display room here, and I would like to introduce the electronic drums for you in person. You could bring your son here, and he can try the drum kits himself. Changhua is not too far from Taipei, it only takes 2~3 hours by a train. Hi, do you ship products overseas? I am from Singapore and only 2 models are offered here. The cheapest here is SGD 1099 which is rather expensive for me as I am a beginner. Is there a beginner set which I can order to be delivered? Thanks very much! I’m sure it’s much too late now, but we just found your blog comment and thought we’d reply to let you know XM eDrum is very sorry for never replying to your message. We are now under new management, and it looks as though the previous team did not keep a good eye on the XM Blog comments. If there is any chance you may still be interested, yes we can provide you with an XM 5S Series or 8S Series, which are our less expensive models. You may like the XM Proceed Series ZP-5S/ZP-5SR, the XM Tempo Series T-5SR/T-8SR, or the XM iStyle ZX-8SR eDrum kits. These are all quite simple kits that are less expensive than the higher echelon models you must have seen. Please let us know if we can still help you, and if not, know that are genuinely sorry for a predecessors’ lack of communication quality. Thanks! Wouls you please inform me how to get your product prices and is the shipment handeled to France ? We are extremely sorry about the lateness of this reply to your message, but XM eDrum went through massive managerial changes last year and sadly your message went unnoticed. For your information Simon no longer works with XM eDrum, but we have a passionate new international team that would love to be of service to you. We do not currently have a distributor in France, but we can deliver globally straight from Taiwan. If there is a chance that you are still interested, the current 2015 price for the XM XBD 18-inch bass drum without pedal is $329.00USD including shipment. You can buy this from XM’s US eBay store, or from XM eDrum directly using a secure PayPal payment system. If you still require your pads to be replaced, please let us know how many you need and we can quote you for them. We understand your issue with the lack of pricing on our website, but we sell to many different countries, and due to currency fluctuation, the prices can vary a lot. This is an issue we are working on now, and we intend to find a solution so that our prices can be transparent to customers no matter which country they are located in. Merci eDrummer! Buenos días ,soy Rafael Martín, un batería profesional de españa profesor titulado superior en Batería y percusión por la universidad de Barcelona ESMUC. Actualmente trabajo en enseñanza y realizo seminarios, conciertos y grabaciones con distintos artistas de mi pais he sido endorser de la marca de baterías TAMA, platos UFIP y percusión PEPOTE. Estoy pensando en cambiar mi set Roland TD12kx por otro con cascos más parecidos a los de una batería acustica y estoy interesado en su marca pero en españa no encuentro ditribuidor .¿Donde puedo comprar una de sus batería? ¿estaría dispuesto ha hacer algún tipo de esponsorización `para representar su marca en mi pais?. Atentamente me despido de usted y espero noticias suyas. Gracias for your support of XM eDrum Rafael. We do not currently have a distributor in Spain, but we are able to ship our products anywhere in the world from Taiwan. It sounds like you may be interested in our XM Evolution Mesh Head Drum Skins to use together with acoustic drum shells? If this is the case, and you are still interested, please let us know. If you are able to popularise our XM eDrum products in your Spanish drumming classes etc. (and share YouTube videos of you and your students playing the XM eDrum products with us for promotional purposes), we would do our best to provide you with a great price. Please feel free to contact us again with any questions or comments you may have, and again, sorry for our late reply. Thanks! Hi Weh Lee, thank you very much for the positive comment. Actually Simon left XM eDrum nearly 2 years ago, and we now have a new international team, together with improved products, research, and development. He started XM, but there was a whole team behind him, and this team has now grown in both size and passion for what we do. Just so you’re aware, we do have an authorised XM eDrum dealer in Canada – they are called Beat It Music, and are located in Calgary. If you ever need anything XM-related they’ll be the best people to call – including if you want one of our monster kits one day! Beat It Music: 1-403-242-9494. Thank you again for the support and kind words. Keep on drumming with XM! I am just trying to get hold of your technical support team for some issues of my WM module which I boutgh a few years back. I am trying to get a got of the manual or much even better for a setup video clips as I am having trouble in getting my module programmed. really appreciate if you can advise. I read your story on creating the xm drums I’m happy that you made a better drum sound than Roland and Yamaha I got tired of the limited sounds of my Roland Vdrums drums and sold them i have been looking to buy the xm master set series but I’m having a hard time finding them. Maybe I could get a website to buy them and ship the here in usa. Thank you . Thank you very much for your interest in XM eDrum. XM drummers in the USA can currently purchase all of our products through our US eBay store. This is done via a secure PayPal transaction, and the price includes delivery via Air Express. Most kits will arrive in the USA within 1 week of being sent. Here is a link to the Master Series C-MAX-110SR EDRUM KIT in our US eBay store. As shown on the product page we have eight colors from which to choose from for your eDrum shells. Simply let us know which colour you would prefer when making your order.